I can't find the Grandaddy version (the ending part to the ELO's vesion) of this anywhere. If anyone knows it or could figure it out that would be great! I want to know the piano part of it by the way. Thanks in advance. Yeah I don't think anyone has ever bothered to tab this one out (much to my annoyance - all the ELO tabs end at the end of the proper song so they're no help). I think this one might require some collaboration: its a hard one! This 6 bar phrase is repeated a whole bunch of times and I don't think it changes at all until Jason starts "making it up" during the fade-out. And thus ends my take on the most beautiful chord sequence ever written. It doesn't matter how much stick ELO get for being a bit crigeworthy at times and that they sometimes got their blend of classical and rock completely wrong, those 2 and a bit minutes make up for it all. thanks! I know it was hard, but there is no song too hard for the brassman! But my computer crashed and I am using my iPod Touch. One thing in the music notation that confused me is the 4th note of the 4th measure appears to be a B#, but there isn't a B# (or at least a B# is a C). Though I will easily admit ignorance of music notation. EDIT: It's in the text too G#7 (G#) (that's F# G# B# D#), is this a piano thing? 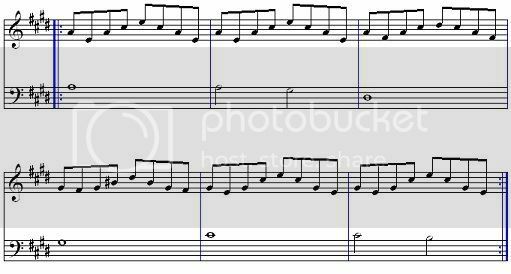 EDIT: Time passes and I'm more confused by music notation than ever, but the correct tab is above. Its just the way of the world I'm afraid - one of the most confusing and stupid aspects of music theory: The double sharp! Apparently if you're a violinist (I'm not) then B# and C are different notes in some way other than pitch. This just serves to get on the nerves of every other musician in the world. The chord of G major is G B D as we all know and love. The key signature has one sharp: F#. If you go round through the key signatures you eventually reach G# major (which is off the scale and has usually been replaced by the much more friendly A-flat which has 4 flats: B, E, A and D) G# major enjoys having 8 sharps: F, C, G, D, A, E, B and F (again). So, E#, B# and F## (double sharp) are all effectively F, C and G. Hence, the chord of G# major is G#, B# (or C), D#. Which makes it all surprisingly easy-ish and the retuning isn't majorly drastic so its easy to put right when you're done.